A spin off brand from the world famous shoe company ALDO, call it spring has everything you need for practical, luxurious everyday shoes, boots, sandals, bags and accessories for everyone. Available in your local mall, Spring has that pair you need at a price you’ll love. Call it Spring Boxing Day / Week Sale 2015: 30% off everything: Boot promo: $20 off selected women's and men's boots. 30% off everything in store. Call It Spring Canada is having their Boxing Day 2014 sale on right now! 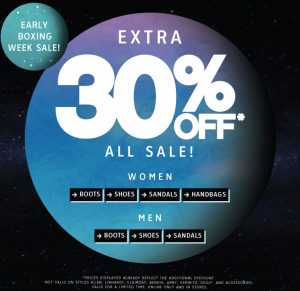 Save an extra 30% off on everything. Not valid on select women's boots styles AIN, CARLY, CASTELLACCIA, DALMENY, clearance, and accessories. This Call It Spring offer is valid online from today, Wednesday December 24 until Friday, December 26, 2014 until 11:59PM (EST). The Call It Spring is valid in store for one day only on Friday, December 26, 2014. Also, Call It Spring is offering FREE STANDARD SHIPPING on all online orders over $50. The cost for shipping will automatically be deducted at checkout for all eligible orders. Shop Call it Spring's Early Boxing Week Sale! 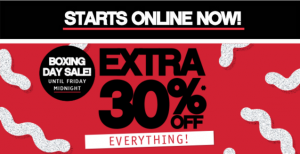 Take an extra 30% Off everything sale! Shop for men and women's boots, shoes, sandals and handbags at a fraction of the original cost! This discount applies to all sale merchandise. The prices displayed already reflect the additional discount. You will also receive FREE Shipping for a limited time on all orders over $50 (before taxes). The cost for shipping is automatically deducted at checkout if your purchase is eligible. 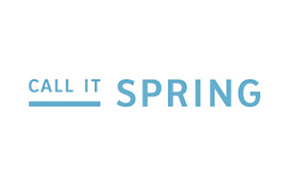 Check out Call it Spring's early Boxing Day Sales here at CallItSpring.com! On top of these great sales save an extra 50% on all clearance shoes and sandals as well as 50% on clearance boots and handbags.